The neighborhood once known simply as North Charlotte was originally a textile mill community. However the historic art district has undergone revitalization over the past decade and is now a widely acclaimed and visited area within Charlotte, with its main commercial strip full of eclectic art galleries, restaurants, and entertainment venues. Today the historic neighborhood is more commonly known as the North Davidson Arts District and locally, we simply call it NoDa for short. Just a few miles to the northeast of Uptown Charlotte the convenience and residential variety make it a very popular destination for locals, visitors, and home buyers alike. Many of the homes in The NoDa Art District were built in the early 1900′s to provide housing for the mill workers. Nevertheless, these Craftsman style bungalow homes are very popular for renovation projects and they are often done speculatively by contractors, investors, and residents. The affordable housing prices within The Art District is the big draw and capable of attracting young first-time home-buyers who appreciate the close proximity to Uptown Charlotte and the eclectic nature of this unique neighborhood. 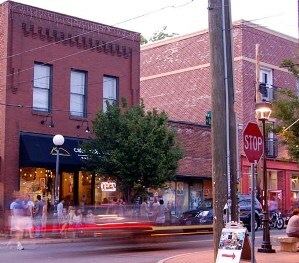 Approximately 30-40% of residential homes for sale within the NoDa Arts District are Condo or Townhouses. A few of the major communities include Steel Gardens, The Renaissance, and 28th Row. Steel Gardens is likely the largest of these developments, built by Bonterra Builders. There are a quantity of Short Sale situations within The NoDa Arts District. Short Sale is a term describing a special condition where the list price of a home is below what is owed on the mortgage, thus it indicates the possibility of discount pricing and instant equity. However stress on the term ‘possibility’ is warranted and caution should be exercised as final pricing and sale approval are required of the mortgage holder. The Arts District is located ~2 miles northeast of Uptown Charlotte along North Davidson Street with the center of the NoDa arts and entertainment establishments located at intersection of N Davidson St and 36th St.
For a perspective on the relationship of The Arts District with surrounding subdivisions check out our Arts District Neighborhood Map and view our Arts District Homes for Sale Map. For custom directions from your location, simply click the map marker below to generate and print them out for your convenience.